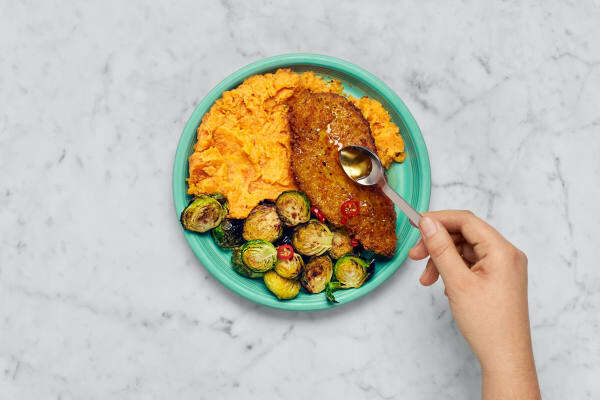 Coat chicken in breadcrumbs and immediately become a mealtime MVP. Crispy chicken is pretty much perfect in any form, but this isn’t your run-of-the-mill schnitzel. This version amps up the flavor, with blackening spices added to both the chicken itself and the panko breadcrumbs. After crisping up in the pan, the cutlets receive a drizzle of honey and a sprinkle of chili for a sweet-and-spicy-sensation. 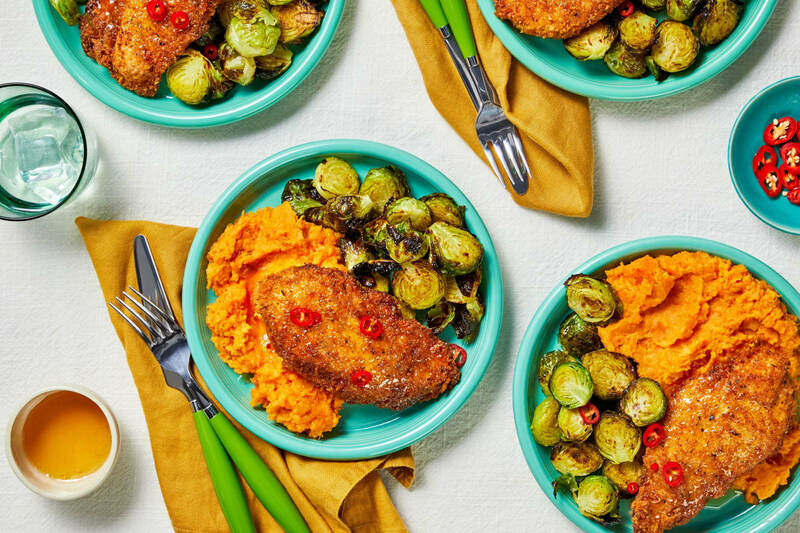 We’re serving these alongside a heap of creamy mashed sweet potatoes and simply roasted Brussels sprouts, because you deserve maximum deliciousness. Place a foil-lined baking sheet on upper rack and preheat oven to 425 degrees. Wash and dry all produce. Trim and halve Brussels sprouts. Dice sweet potatoes into ½-inch cubes. Thinly slice chilis, removing ribs and seeds for less heat. Place sweet potatoes in a large pot with enough salted water to cover by 2 inches. Bring to a boil and cook until tender, about 15 minutes. Drain thoroughly and return to pot. 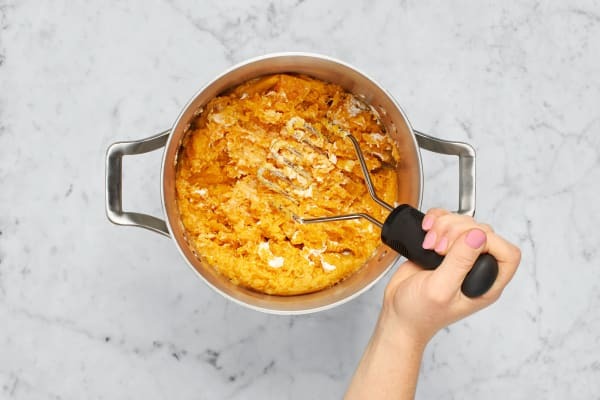 Using a potato masher or fork, mash with 2 TBSP butter and half the sour cream until smooth. Season with salt and pepper. Keep covered until ready to serve. 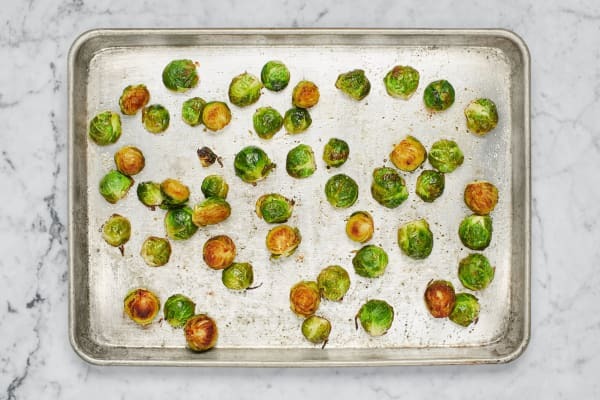 Meanwhile, toss Brussels sprouts on preheated baking sheet with a large drizzle of olive oil and a pinch of salt and pepper. Arrange cut sides down and roast until browned and tender, 20-25 minutes. 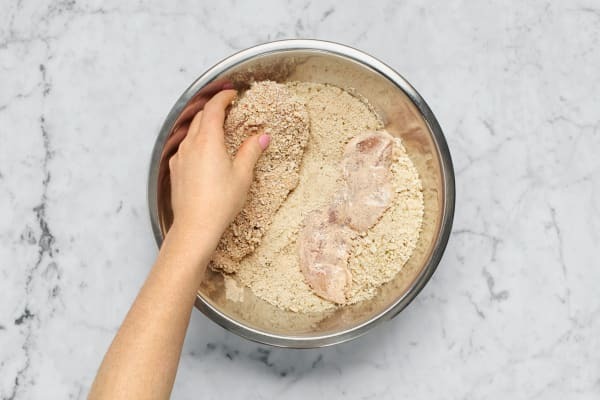 Place panko in a shallow dish or bowl; season with salt, pepper, and half the Blackening Spice. Pat chicken dry with paper towels; season with salt, pepper, and remaining Blackening Spice, then brush evenly with remaining sour cream. Working in batches, coat chicken in panko mixture, pressing to adhere. Heat a ¼-inch layer of oil in a large pan over medium-high heat (use a nonstick pan if you have one). 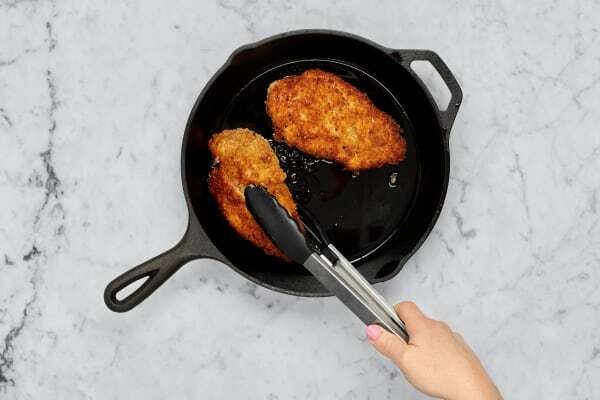 Once oil is hot, add chicken to pan (working in batches if necessary), reduce heat to medium, and cook until golden brown, 5-7 minutes per side. Transfer to a paper-towel-lined plate. Season with salt and pepper. 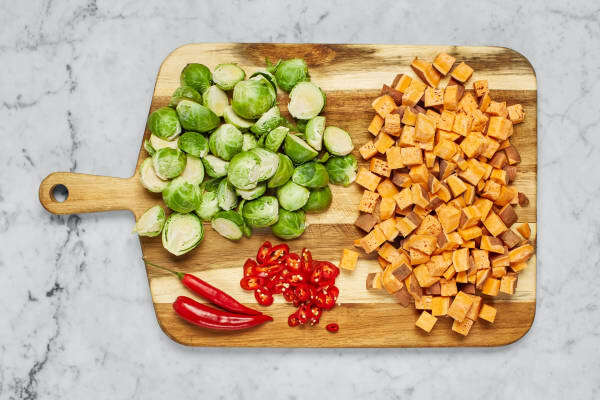 Divide Brussels sprouts and sweet potatoes between plates. Top with chicken. Drizzle chicken with honey. Garnish with chilis (to taste—they’re spicy).